Need a more efficient way to wash and dry dishes? A simple way to make sure you are getting the right proportion of vegetables? Fancy a simulated experience on the International Space Station? You could have had it all April 16 during Science Night at Holy Family School in Southeast Portland. The school's partnership with Oregon Museum of Science and Industry provides entrée into science demonstrations and talks. 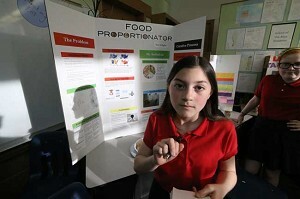 Fifth grader Viviana DePinto wowed the crowd with the simplicty of what she called the “Food Proportionator.” DePinto took federal food guidelines. Using the numbers, she created a plate-sized round frame with various piece-of-pie shapes built in — it looked like a peace sign with a few extra lines. Each space is labeled for vegetables, fruits, starches and proteins. The frame can sit on a plate, be filled with the right eats and then be taken off, leaving a balanced meal ready to go. Nearby, fifth grader Anna Waldron created a two-sided mitt for washing and drying dishes. One side does the scrubbing, the other side the drying. Sixth graders created the model space station, which included a living quarters. “The more we can have our children exposed to science and inventiveness, the better,” said Dawn Pierce, mother of a fifth grader.